Le Kit de Découverte des Chants de Loss est prévu pour donner une idée du jeu, dont le développement se poursuit sur le site de l’éditeur. Le Kit est disponible en téléchargement sur le site en version couleurs, mais la version papier est en noir et blanc, hormis la couverture. Il s’ouvre sur la couverture, le titre et les crédits (4 pages), avant que Les Chants de Loss (2 pages) ne présente le jeu. There are places where foul essences seep out of the depths and into the light of day. While the purifying light is usually enough to destroy the humours and disperse the foul gasses, there are places on the borderlands between the depths and the lands above where the dark miasma remains, dilute but persistent. There is a field near Gladecrest Village where the cattle is never sent to graze. It’s said that those who did gave sour milk and birthed six-legged monstrosities. On that stony hill there is a gap between the rocks surrounded by thistles. Through the gap a set of stairs obviously cut by hand into what was a steep descent along a stone cave wall. 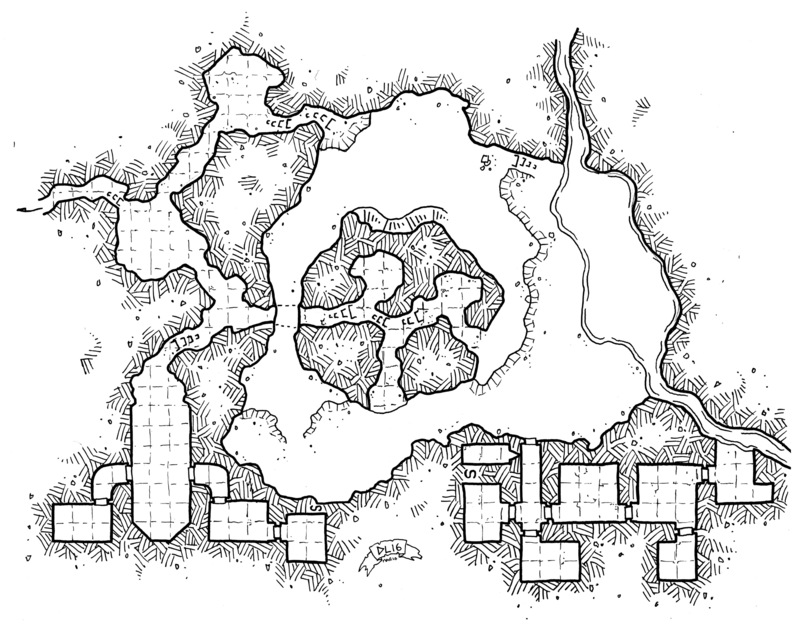 Those entering the cave are warned by the townfolk that people who breath the air here find themselves the victims of fierce fevers and hallucinations, and bloody coughing fits that occasionally even lead to death. The large cave lies beneath the field, fed by an underground stream of unknown provenance and destination, pooling silently in the depths. With the mix of water from the stream and dirt and water washed down from above, the cavern has a mossy floor and in the darker reaches is covered in a thin layer of fungi with a few larger growths in the mix (including a few shriekers and violet fungi). Near the pool is a small fortified structure dug into the walls where the stream once passed. Worked from the limestone and beautifully adorned by small humanoids of one kind or another (pech? svirneblin? gnomes? perhaps even tainted halflings or a particularly artistic tribe of goblins?) that was then abandoned and is now home to the myconids who found the area abandoned when they came from the depths below. More interesting to explorers and adventurers is another area obviously dug out and expanded from natural caves. Once a temple and tomb, those with the time and energy could probably clean it up enough to determine who the original inhabitants of this cave were. The main temple is now home to some particularly nasty forms of fungus and light-deprived lichens, mutated and twisted by the foul emanations from the deep. A trio of fungal shambling mounds (treat as normal, except they also pass along disease and pestilence to who would disturb them) grow along the walls and floors of this chamber, sealing off the side passages to a tomb on the west side and the priests’ chambers of the original temple on the right. In interesting side-note about this map is that it was drawn when I was in a pretty heavy fever myself (thus the inspiration for the contents and name) and it was only at the end of last month that I found it while going through my maps to scan for this month… I had zero recollection of drawing it (or another two maps for a commission that same week), but found the work-in-progress photos posted above in my social media feeds from that week. That was a pretty intense fever! Les auteurs de la nouvelle édition d’Ecryme vous expose leur travail.